As everyone knows I am currently attempting to get my writer's bottom under control. I have come a long way but still have further to go. And everyone needs inspiration some days. My inspiration this week comes from the fabulous Angi Morgan who wrote about her journey on the Healthy Writer's Blog -- 99 lbs in about 9 months (plus coming off five serious medications). I had the privilege of meeting Angi at this year's RWA. It floored me when I realised how much weight she has lost. It is one of those things -- people who didn't know you before do not have anything to judge you by. Given her vibrant personality, I thought she must have been one of those people who are just naturally thin and beautiful. Or if she worked out, it was because she always had done so. The bottom line was that she looked great because she worked hard. And she continues to work hard. Being fit is not a get down to that weight by starvation thing and suddenly you will always be there. It is about working hard. After a certain age, you do have to work at it and you have to keep working at it. This is why I prefer exercise and healthy eating to hugely restrictive diets. It may take longer but it has become a life style rather than a regime. Moderation. It also has to come from within. Something hits you between the eyes and you and you alone take responsibility and make the changes necessary. So if you need some inspiration to get you started on your journey to looking fab or to keep you going, read Angi's story. It is never easy but it is worth it! I am at the Pink Heart Society today, talking about personalisation and why it is necessary to go beyond character sheets and really dig deep to find out more about your characters and how you can use it to make sure your characters act consistently. Currently I am working away on my wip which is due 1 September. It will get there. It just isn't there yet. However I have discovered what I meant to do in the latter bit won't work. It is unnecessary and over the top. I did do the draw from my newsletter -- Anne Graham and Lorraine were the people and they have already been contacted and responded. Thank you to everyone who entered. Last week, the physio visited (I had the wrong day down) and did her measurements. Although I had my bandage on when she arrived, I will admit to getting slack about my bandages. However, it showed. ( some thickening in the left arm, Michelle said with a shake of her head) The physio is quite relaxed about the whole thing and said it meant I was starting to accept the condition more. She gently pointed out that I should be wearing the compression bandages while I type or do exercise because I am actively moving muscles in my arm. Typing does cause my arm to be held in one position for a long time. So it is back to wearing the bandages almost all the time. And I can see a difference. In the mornings, my wedding ring is wedged solidly on. After a few hours of wearing the bandages, I can move it. I am also now wearing the bandage when I do my exercising dvds. However I have also discovered that I can wash them in the washing machine and use the dryer. They do retain their shape. It means they are getting clean. Handwashing (manfacturer's rec) was just not doing it. The important thing is that I have thus far avoided serious infection. It is the pooling of the lymph and the opportunities it presents for cellulitus that is the real worry with lymph oedemia. With exercising, I noticed after the RWA, the waist bands of several garments were tight. Wearing something with a fixed waist is better than an elastic waist band -- it gives instant feedback and is less forgiving. It meant I went back to the Jillian Michaels Burn Fat. Boost Metabolism and really have worked hard. If you want to lose the fat, you have to sweat and burn calories. The 10 minute solution total body one is also good. Things are improving again. But it was that early warning of the waist band which provided the wake up call. The ducklings are growing and know which is their safe house now. It has been RAINING here. Hard. The gutters overflowed yesterday, sending water cascading into the sun room. Urgent action had to be taken so I ended up a ladder in the pelting rain, clearing the gutter. However before I could get there, my daughter noticed that the drains were not being able to cope with the water. This was strange as I recently had the drains cleaned. I may have done but Northumberland County Council Highways Department has not. Their drains backed up, water flowed down the North Bank and into our gate. The hardstanding where we park the cars became a lake. And the water was inching ever closer to the front door. We built a levee outside the gates and managed to divert the water away. It flowed further down the bank and became someone else's problem. We now have gullies where pathways used to be and silt blocking up the drive. The road on the North Bank is crumbling even more. On the plus side, the gutter on the sun room is clean and the water didn't reach the new carpet (much). However, as the Highways Agency swears its drains are unblocked (they are covered in silt and mud), I can see that this is going to keep recurring. We are in the process of getting new granite curb sets (a permanent levee) as then the water will not be able to flow into our property. More heavy rain is forecast for today. The ducklings were singularly unperturbed by the rain. The dogs and cats decided indoors was by far the best place to be. The four ducklings have settled into their life in the pen. However, I had forgotten how troublesome ducklings can be. They are supposed to go into the apex house to sleep as none other ducks are using that house at the moment. The mother duck keeps forgetting so my youngest and I have to catch her with the fishing net, put her in and then catch the ducklings. This is all accomplished in the evening gloom. It is made more difficult by the fact that the pen is covered in netting and it has to be done in a crouch. After capture, we close up that duck house and open the other two duck houses, unblock the route into the pen the grown ducks like to use and release Hardy and Tess to help with the round up. In the morning the process is reversed. The ducklings have to be checked several times a day for food, water and escape potential. Yesterday my youngest had to play rescue duckling as several had escaped into the stream. The mother duck couldn't get out, but the ducklings could and did. They chirped loudly but kept wriggling away from my youngest. That route has now been blocked. 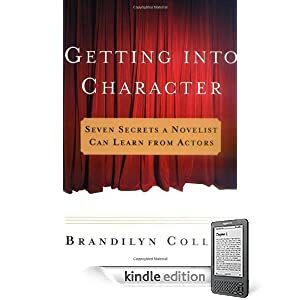 When Fiona Harper recommended Getting Into Character -- Seven Secrets Novelists Can Learn from Actors by Brandilyn Collins at her RWA workshop, I knew I had to read that particular craft book. It was even better that it was available on kindle! (As a side note, I was annoyed Micheal Hauge's Writing Screenplays that Sell is NOT available on the UK kindle. I did get the book but would have preferred the kindle version...my bookself space is very limited) As Fiona likes the same sort of craft books, I tend to trust her judgement. Ever since Natasha Oakley explained that she had no difficulty in developing characters because of her acting background and Susan Elizabeth Philips also mentioned how acting helped her develop her characters, I have been after finding a book which explains the connection. I don't come from an acting background and felt this part of my craft knowledge was severely lacking. This led me in the first instance to Orson Scott Card's brilliant Characters and Viewpoints but that book didn't really go into the nitty-gritty of how actors operate. Getting Into Character does and it also explains the reasoning and the adaptations novelists can make. Collins used Stavinsky's Method Acting as a launchpad for delving into character. She details the 7 secrets -- peronsalizing, action objectives, subtexting, colouring passions, inner rhythm, restraint and control and finally emotional memory (how a novelist can use emotional memories of seemingly mundane things to understand the highly charged emotions of their characters). For example, we have all been intent on murder at times -- mosquitoes and flies generally being the target. It is a matter of harvesting those emotions to give resonance to the character. She also gets you thinking about how to portray a wide variety of emotions on the page. Anger can take many forms from mid irritation to cold blooded revenge to explosion. And how that anger is portrayed will depend a lot on the character and her back story, values, and the way she sees herself. So now I know and the book does make me think. It is useful and is one way to approach character building, although not the only way. Over the next few weeks (and months) you should be seeing a few changes on my website and blog etc. After taking a class in Marketing and Branding from Harlequin, I realised that my tagline -- Passionate about History, Passionate about Romance was too general.An author's brand is her voice and her tagline should reflect this. It needs to be specific to the author and reflect the heart of her stories. And that tagline could be applied to any number of authors. At the conference, Malle Vallik who led the course agreed with my assessment. It is fine but it could be applied to any number of authors and doesn't really go to the heart of what I write. I trust Malle. She has forgotten more about author branding than most authors will ever learn. My new tagline is Warm,Witty and Intimate Historical Romance from Michelle Styles. It is far more specific and goes much more to the heart of what I write. For the record, Malle thought it better as well. I will be working to overhaul my website so it better reflects my warm, witty and intimate approach. So if there are elements that you think should be there, please tell me. One thing I know that has been missing are BUY buttons. I want to make it easier for people who might like my books to buy my books. It will be a work in progress for awhile but the plan is to have it done before my books are released as digital exclusives. Funny how things can concentrate your mind! As it was a picture (well several) from last year's Harlequin party in Orlando which finally made me face the fact that I really had to work at it, I thought I'd give last year's picture and this year. Note: no waist last year. (I was also wearing two layers of magic knickers) Rather more waist this year. The black dress belonged to my grandmother and was orginally bought for Fasching in 1949. It is now at the dry cleaners. They were rather worried about the beading but what can I do? I did dance all night in it. I think the picture from the digital day shows my waist better. Again the top is my grandmother's. When she died, I gained a new vintage wardrobe.... 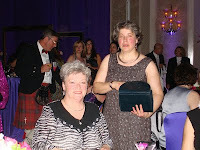 The picture is with Blythe Gifford and my cp Donna Alward who is looking fab. HOWEVER, I did eat rather too much and didn't any exercise so this week it has been back to Jillian Michaels 6 weeks 6 pack flat abs fast. I have the AMBA lunch at the end of October as my next goal. Professional pride is a great motivator. 1. 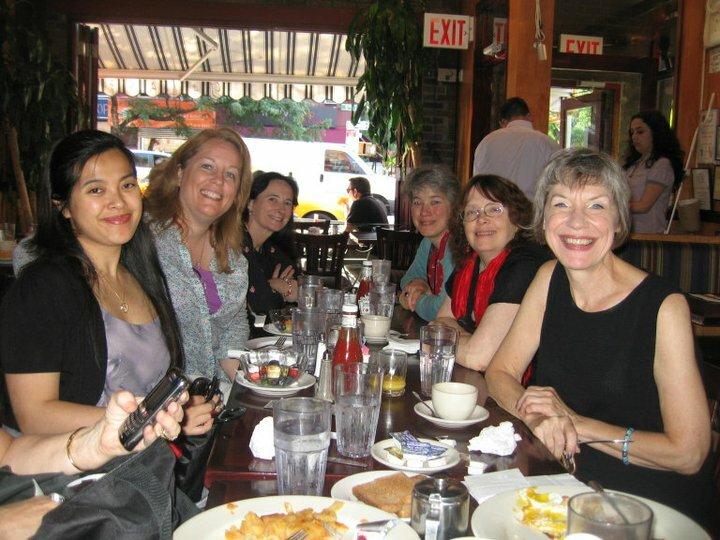 The Book blogger tea. My daughter is still wearing the fascinator that I acquired. It was utterly fantastic to meet so many reviewers including Pearl from Realms on Our Bookshelves and Lyn Spencer from All About Romance. I had a great discussion about late 18th century novels with Anime June. I think that they will repeat this next year and it is worth while going. 2. The Harlequin PJ Party. I went in my PJs much to my son and daughter's disgust. 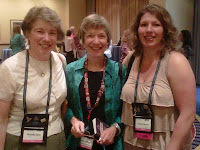 Deb Hale was there and so finally after many years, I was able to meet an author whom I consider a real mentor and who really encouraged me to write historicals when I was just toying with the idea. The eharlequin Library lives long in my memory. 3. The Hussie's breakfast. 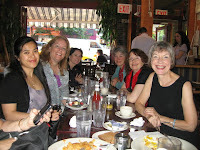 Every year the Harlequin Historical authors meet for breakfast and a chat. This year we went to the Glaxay Diner which Michelle Willingham found (Michelle W is great at organising) and it was wonderful just to catch up, particularily as Historical is going to simultaneous publication. Also the Historical authors were able to plan some upcoming events as we really do believe in the power of the series. 4. The Historical Tea. We took a stretch limo to the tea which was at the Mt Vernon Hotel Museum (a hidden gem of NYC). It used to be called the Abigail Adams Smith House but the curators decided that the link was tenous and they wanted to protray it as a day hotel from the 1820s. I was able to stay for the tour which was precisely the sort of thing I love but not the tea as I had doubled booked. 5. 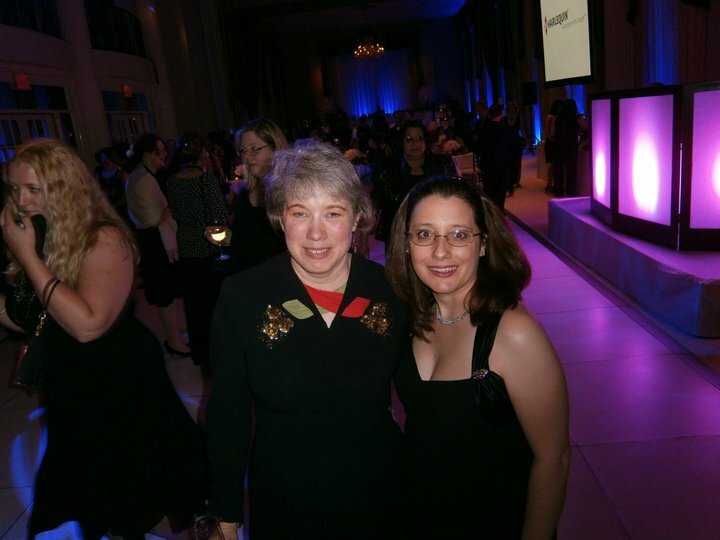 The Harlequin Black and White Party. It was truly amazing. Everyone bare one or two was in either black or white. The venue was sublime. They gave out black Harlequin socks so I was able to kick off my shoes and dance. It is the ONE time I get to dance without anyone commenting about how rubbish I am. I stay to near the end...ALl I can say is that if you can go, go. 6. finally the Rita awards ceremony. It was fantastic to see the amazing achievements of the women who won. Sharon Sala's speech had me in tears. Afterwards we went up to the View, which is a rotating bar and had a drink. The view of NYC at night is unforgettable. My July newsletter has finally gone out! It has its usual contest for a copy of my latest. The big news is that Harlequin Historical is going to simultaneous publication in the US and the UK. This means my books will be out at the same time! Hooray. HOWEVER, 3 of my books will be going as digital exclusives in the North American market (dates to be confirmed but before May 2012) -- Compromising Miss Milton, Breaking the Governess's Rules and To Marry A Matchmaker. I shall be doing a FREE prequel to Compromising Miss Milton which will be available wherever ebooks are sold. Harlequin is supporting me in this and my very lovely editor has agreed to edit the short novella. While I would have loved the books to have print editions in the US, I have decided to be really excited about the challenge and to embrace the opportunities this change presents. The digital revolution is really gathering pace and it is great to be in the forefront. If you want a print edition of one of those three books, I recommend getting the UK version. New copies of Compromising Miss Milton are hard to come by. In fact, I don't have any personally. My editor is working on getting me a few copies for giveaways when it is released as an ebook. New copies of Breaking the Governess's Rules and To Marry A Matchmaker are easy to come by. The best place to get copies if you live in the US is The Book Depository (www.bookdepository.co.uk) as they do free worldwide shipping. Mills and Boon does flat rate shipping and then there is Amazon.ca or Amazon.co.uk. A number of other UK first Harlequin Historical authors are also caught up in this, so you would need to check if they are going to be digital exclusive or not. This is so the inventory can be caught up. In the UK, unreleased US first books will be going as special 2 in 1 books. Again check your favourite Mills and Boon Historical author's website to see what is happening!!!! When Ben and Eleanor comes out (sometime after May 2012), it will be going as print and digital in both markets at the same time. Once I know the dates, I will let people know. And this will be true of all my future books as well. 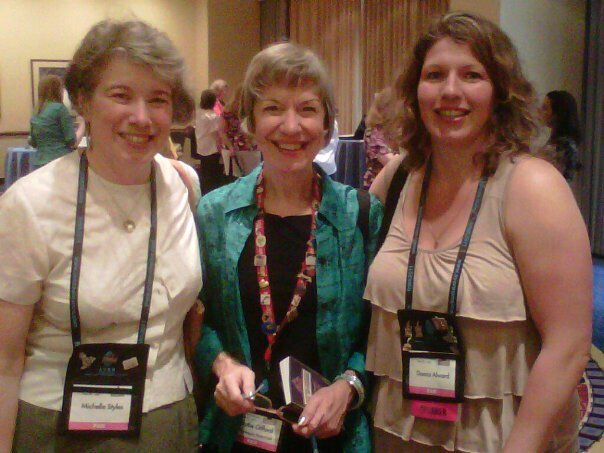 The RWA conference was amazing but then it always is. It was a bit different for me this time as my daughter, son and sister were there. We were able to have a private meeting during conference and lots of lovely things flowed from that. My website will be getting a makeover and I have a lovely new tagline -- Warm, witty and intimate historical romance from Michelle Styles. Digital is growing expontentially. No one is sure when or where it will stop. After only a few weeks with my kindle, I can understand why avid readers are going digital. It is just easier. The Ethan Ellenberg workshop which was given by an associate of Ethan Ellenberg as he had a family emergency confirmed some of what I was thinking. If you are interested in contracts and the nitty gritty about ebook publishing, it is worth listening to as it was recorded. Basically you do want a publisher with clout and authority. Yes, digital has changed things but you still need distribution. The gate keepers remain and unless you know about metadata, platforms and searchability, you will be lost. Self-publishing does remain vanity. Very few people make money from self-publishing. The barriers to entry may be lowered but...you are essentially becoming your own publishing house and have to create your distribution network etc. If anyone ever needs to be inspired, it is worth reading Sherrilyn Kenyon's keynote speech on Facebook. There was not a dry eye in the house. My daughter who was sitting beside me was in awe. You never see the failures and hard work. You often only see the success. But Sherrilyn Kenyon deserves every piece of success that she gets. She got there because she was determined. The Historical Round Up was disappointing. I had hoped to hear about what was going in the genre but the three panelists had ignored Harlequin. For example, Love Inspired Historical is going to 4 books per month starting in Jan 2012. It is one of the fastest growing series in the company. They are actively acquiring Westerns. Harlequin Historical is 6 books per month and they are actively acquiring books from all time periods with G/R/V being the most popular. HH Undone is still going strong (despite Spice Briefs stopping and Nocturne changing) and they are looking to acquire sensual romance across all time periods. The one thing that all the panelists got right was that it is the STORY that counts. I was interested to learn that Pocket calls G/R/V simple Regency. The one piece of interesting news concerns Love Swept. Ballantine/Bantam/Del Rey used to have a series imprint called Love Swept. When I saw the old covers, I knew I had read it. It folded but they are bringing it back in digital. First with old beloved books but they are also acquiring. There are no slots to fill so they can afford to be picky. It is currently digital only and pays 25% NAR. The best way to find out what they want is to follow Sue Grimshaw on twitter. That is how their first signing (Jessica) was taken on.